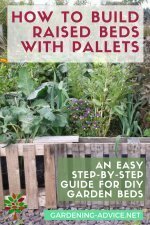 Planting Potatoes is easy! 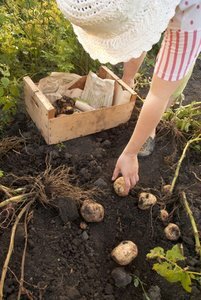 Learn about the different types of potatoes and how to best plant them. Growing potatoes is easy and rewarded with lots of tasty and healthy tubers. 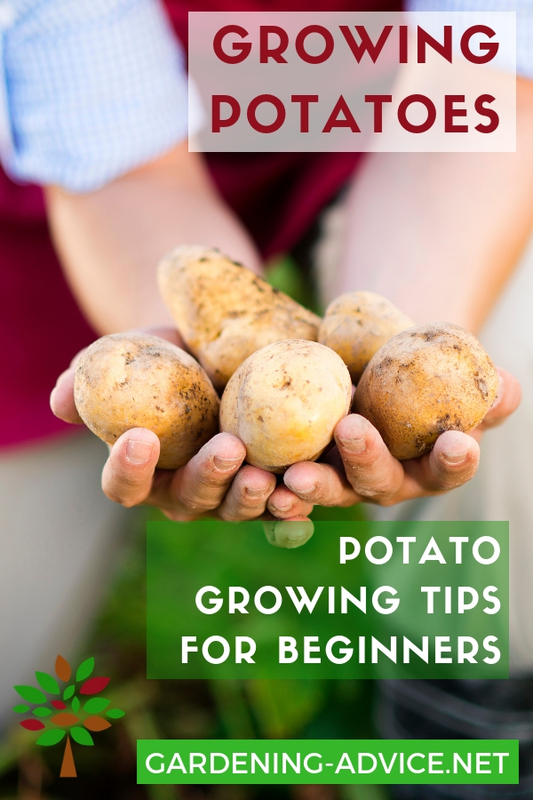 Typically Potatoes are inexpensive and easy to find, so many people don't bother to grow their own. What a mistake, when the potatoes that you grow are far more tasty and nutritious! Most commercial potato crops are heavily sprayed with chemicals you definitely don't want to put into your body. It is easy and very rewarding to grow them yourself. If you have no garden you can even grow potatoes in pots! Why Grow Potatoes In Your Own Garden? Growing Potatoes in your own garden produces a crop that is grown much more naturally with no chemicals and only organic fertilizers. 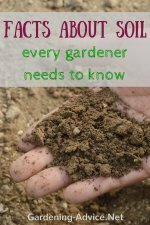 You know what's been in the soil because you put it there. You can depend on the fact that what you are offering to your family is more wholesome because that's the way you grew it. Potato gardening doesn't take much time time or effort, and you'll be pleased with the ease with which you can get a wonderful crop. Which Are The Best Potato Varieties For Your Garden? 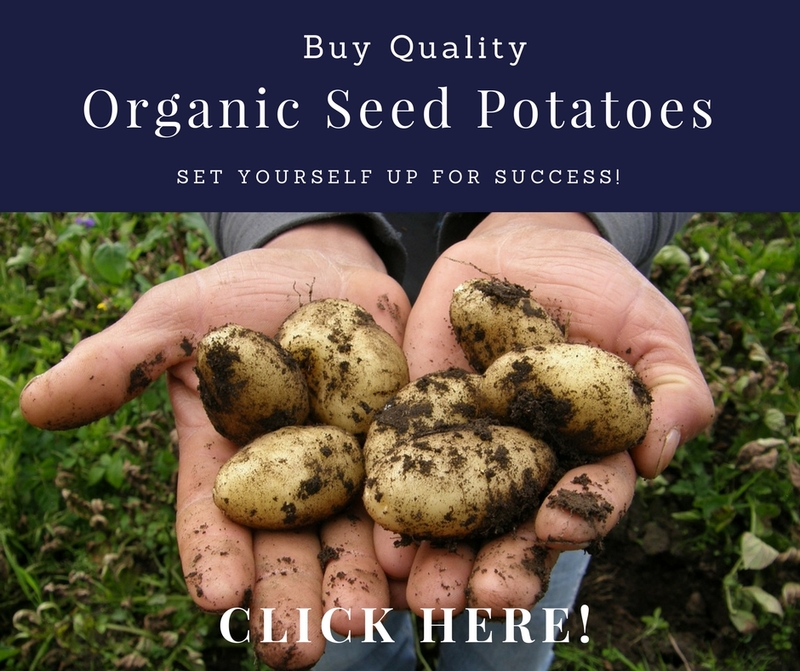 Many different varieties of potatoes are available for you to grow. The different types of potatoes will offer a different look, and in some cases a slightly different taste and texture. Make sure to choose disease resistant varieties that are suitable for organic growing. Look out for scab and resistance to potato blight. Also early varieties are less prone to blight especially if they are grown under garden fleece. Our favourite early potato is 'Colleen'. 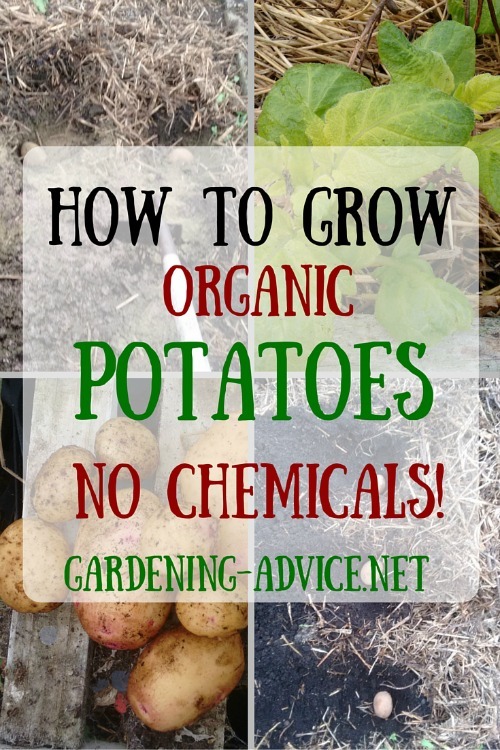 It is a slightly waxy potato with a delicious flavour that needs no spays or chemicals. -Yukon Gold-These are large and meaty potatoes. They offer a slightly yellow color and are marvelous fried or boiled, and are an early to mid-season maturing potato. -Russet Potatoes- maturation takes place mid season. They are a larger potato, store very well into late winter, and make magnificent baking potatoes. -Norkotah Russet-Maturing late in the season, these Russets are also large and fleshy, and make wonderful baked potatoes. -Superior Potatoes-These are a mid season maturing potato that is resistant to some types of disease. They are excellent fried, mashed, boiled or baked. -Red Pontiac-Excellent crop yields, remarkably easy to store, and are a late maturing potato. Not overly large, but mid-sized round potatoes. -Purple Potatoes-also called Blue Potatoes. They really have purple flesh and are very tasty! Varieties are called Purple Peruvian, Purple Mountain or Eureka Purple. Before I start planting potatoes I chit (sprout) them for several weeks inside. Place them into an egg carton in a cool but well lit room. They will start sprouting after a couple of weeks. 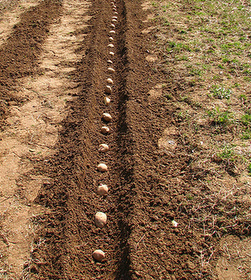 Typically potatoes are grown in rows. 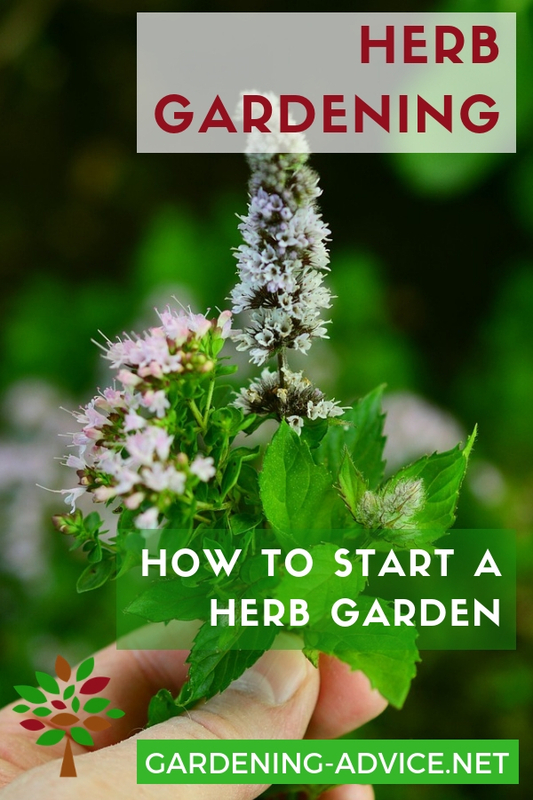 There are several other ways in which you can grow them, however. When planting potatoes, you should begin your rows about 3 feet apart and plant the seed potato about a 18 inches apart in the row. Dig your potato down about 8 inches. 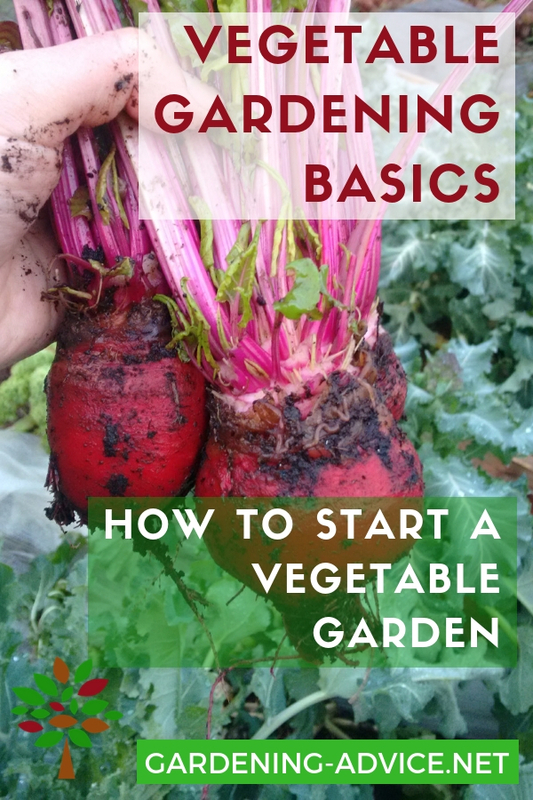 There are several reasons for this but the first and most important is that if growing potatoes are exposed to the sunlight as they grow, they will turn a deep green. This portion of the potato may be toxic. Put your seed potato or the cut potato into the ground cut side down. 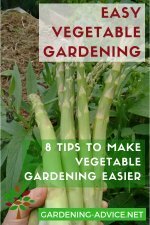 When your stems are 8 or 10 inches tall you're going to add more soil and hill up your potatoes. This is known as mounding the potato. It is done whether you plant in rows or in mounds. If available work some farm yard manure or rotted horse manure into the soil before planting potatoes. If you've got a reasonably good soil, most potatoes will do well and are best left without additives. The natural means to growing them is the best method if you have the option. 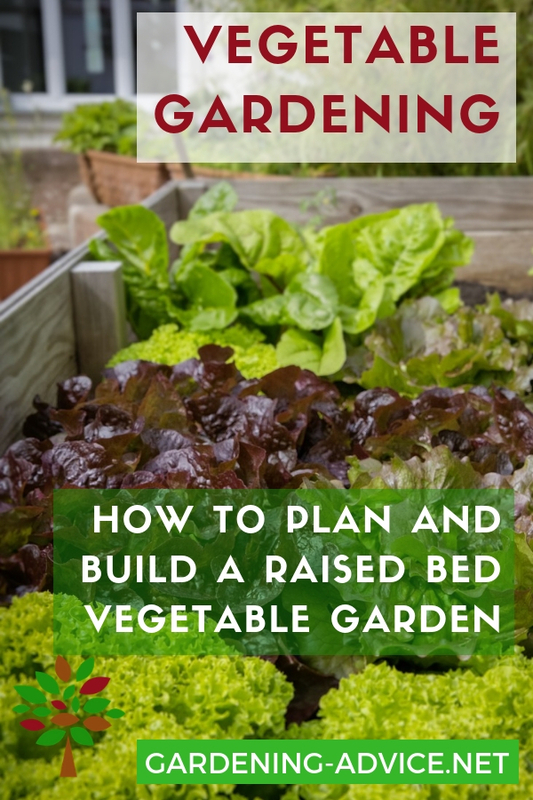 Sprinkle a little bit of wood ash onto your beds before planting. They like a high amount of potash. Watering Potatoes: To Water or Not? 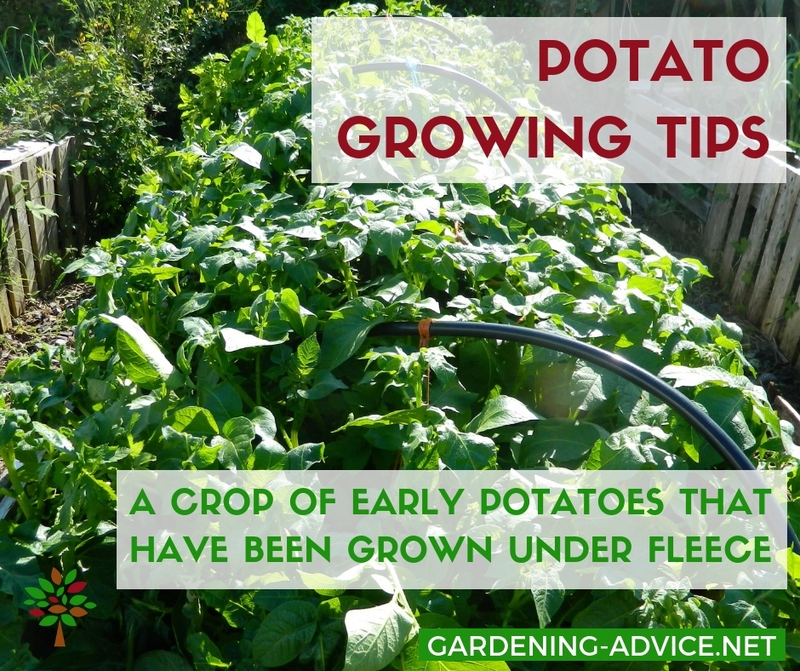 Definitely keep your potatoes moist during their growing, but this is particularly important during the time when they are flowering and maturing. 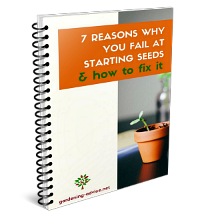 During this time span, water is the most critical element for growth since they are sprouting the new tubers beneath the ground. 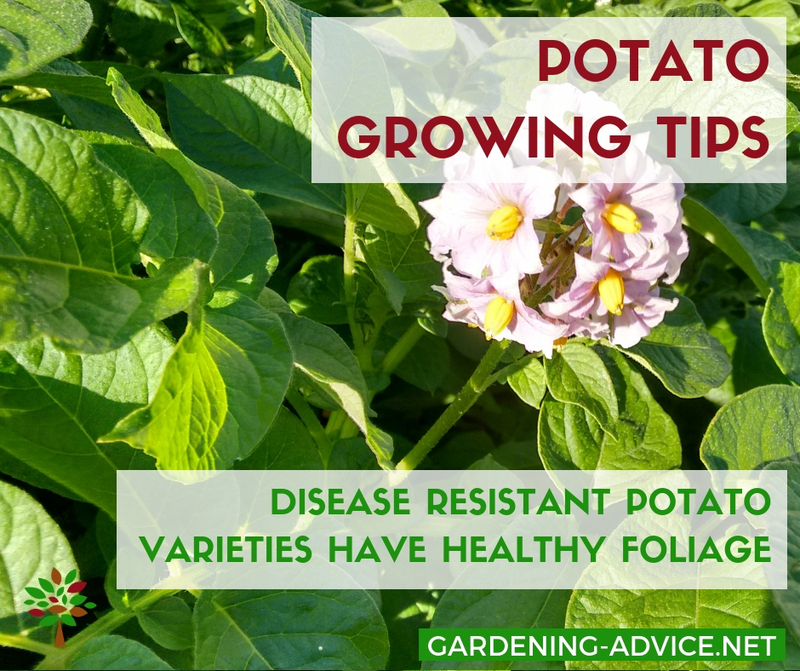 You can start to pick potatoes about 3 weeks after your plants stop the flowering process. You're going to find just the very small ones at this point, perfect to make soups and stews. You can harvest them now, or wait a while to get them larger or you can do both. Harvest part of them and then reach underneath the plant, take away what you want and leave the remainder in the ground. There are some diseases which can affect your potato crop. The best way to avoid these is to avoid planting seed potato varieties that are affected. 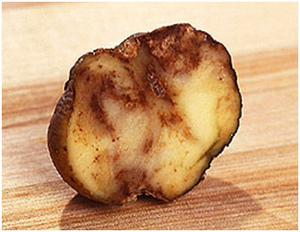 Using certified seed potatoes is a good method but if you are using potatoes which you've cut yourself, then check them carefully for blight or necrotic lesions on the potato and don't use them. Potato blight is a fungal disease that is particularly bad in damp weather conditions. Early potato varieties are less prone to blight than main crops.If you had problems with blight before try some blight resistant varieties that are less prone to the disease. Covering potatoes with garden fleece seems to produce healthier plants. Spraying the foliage with Bordeaux mixture will help to reduce an outbreak of potato blight. This is an organic fungicide that contains copper as an active ingredient. First signs of the disease are dark brown patches on the leaves. 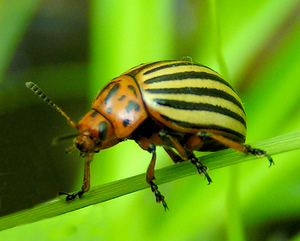 One pest that will readily invade are potato bugs or potato beetles. While it sounds a messy process, and can be, a natural method of ridding yourself of the potato bugs will be to mash them into a pulp, mix them with water and spray the leaves of the potato plants with the mixture.